Last time I was at Forever21 with my sister I picked up a little eyeshadow set to try. I've never tried any beauty products from this store before, so I wasn't sure what to expect, and to be quite honest I didn't have high expectations. The palette cost $6.80 (VERY inexpensive) for 10 shadow colors. Here are some pictures of the colors plus the chic clutch it comes in. The colors are beautiful! 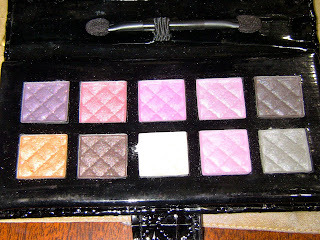 This particular palette is a bit pink heavy but they had other palettes with more neutral colors. I looked online and didn't see this one, so it might be that every store has slightly different ones. This one is from their "Love and Beauty" line and I think it is a great deal for $6.80. The colors are creamy (not super powdery) and have a beautiful shimmer to them. They blend easily and came right off with a MAC wipe. Not only would I completely recommend this palette, but I will be picking up more shadow sets from Forever21 in the future. I think they are incredible quality for a super low cost. One gripe is the packaging... not the super cute clutch case but the actual plastic packaging the product came in... mine was super beat up and looked like the palette had been thrown around a lot (they all looked like that) but that is hardly a gripe when the product is so great.